Adam Driver | "How Would You Fix...?" the Star Wars Sequel Trilogy? You’re thinking it’s a little early to be considering fixing the new Sequel Trilogy when only a third of it has been released. However, while it’s true the recent release of the first instalment, Star Wars Episode VII: The Force Awakens, is meeting with commercial acclaim (even now firing photon torpedoes on Avatar’s record), once the dust has settled it is likely to not maintain the reactive critical acclaim it has to date received and in hindsight will be acknowledged as a hugely entertaining but extremely derivative entry into the saga. I won’t be getting into debates via comments to this article about how this new sequel trilogy might be derivative but will at least be better than any new move that George Lucas has made in the past twenty years, or would likely have made if Disney had allowed him to share custody of the franchise going forward, as we’ve already heard any number of fans reviling the Prequel Trilogy and Clone Wars (just as original fans not only found the Ewoks insufferable, but Yoda before them). My aim in this article is to consider alternatively how a happy medium might have been reached with Disney moving the franchise forward, while at the same time acknowledging how they would not have such a successful franchise had it not been for George Lucas in the first place, through thereby respecting his original vision for the Sequel Trilogy, instead of him ending up having nothing to do with the production of The Force Awakens or its frequently evolving script and the recent news from Lucas himself that his ideas were at least partly scrapped. 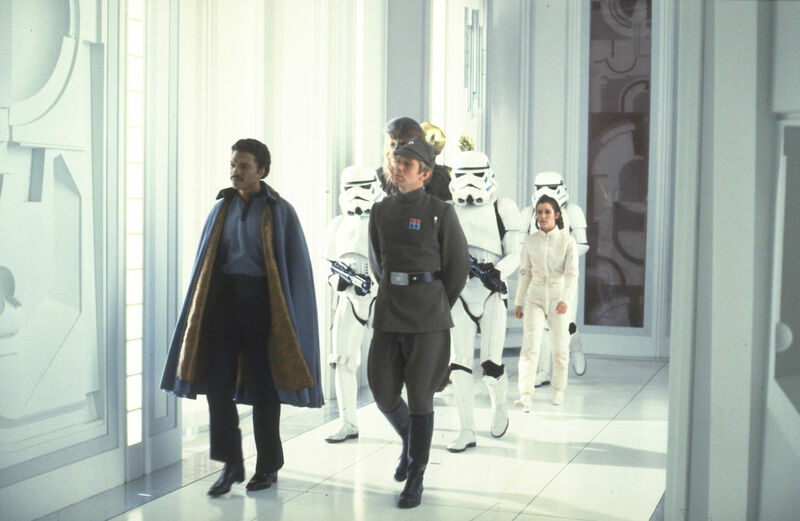 So it’s clear that even as far back as the 1980s, Lucas had envisioned there being another player behind-the-scenes of the Original Trilogy story who had been in control the whole time. 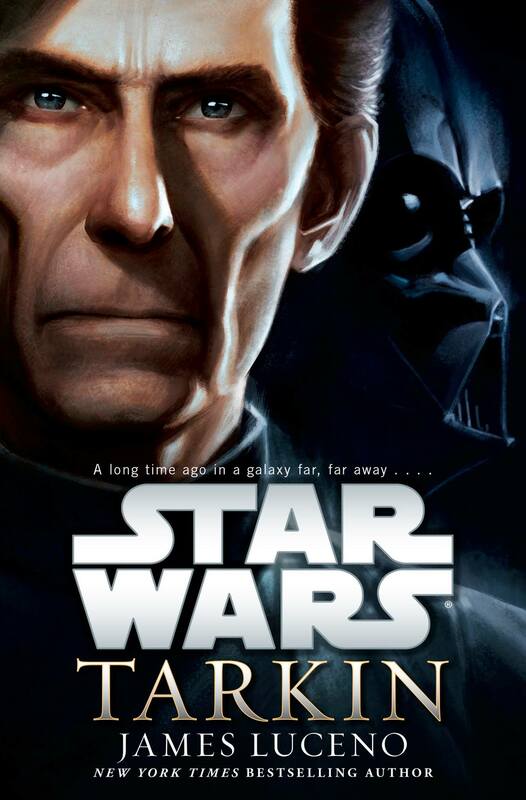 While in this interview, Pollack called the Prequel Trilogy “dreadful”, he had very positive things to say about the ideas behind the next two trilogies, stories he confidently believed Disney would use, claiming they represented one of the reasons Disney made the acquisition of Lucasfilm in the first place. Now while Lucas had obviously intended this character of “profound cunning” to be male, with Disney redirecting their stories in these new films to feature females in more prominent roles (although to give credit where credit is due, Lucas set the precedent in the Original Trilogy by establishing Princess Leia as one of the earliest examples of a female character whose power came from her political conviction and acumen and whose passion influences the two male leads, Luke and Han to take their places as full participants in the Rebellion), is it that they haven’t entirely abandoned Lucas’s original vision for the Sequel Trilogy but have chosen Maz Kanata as this “supreme intellect”, this “Phantom Menace” (and not Jar Jar Binks as has previously been proposed by fellow theorist Lumpawarroo)? 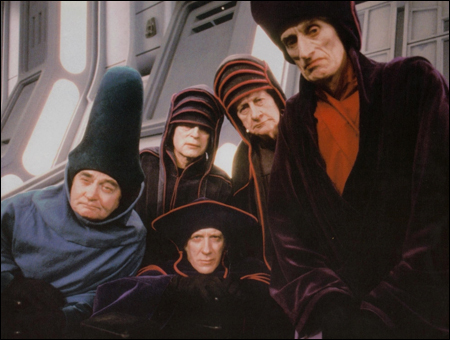 …are identical to those used in the procession at the start of the renowned Pod Race on Boonta Eve in Star Wars Episode I: The Phantom Menace, that she has some connection to Tatooine. …and was it imbued with her Dark Side energies for the purpose of influencing him from as early an age as possible? Think about it too, Maz Kanata slyly watching over Anakin Skywalker on Tatooine a dark parallel to Ben Kenobi’s watching over Luke Skywalker. 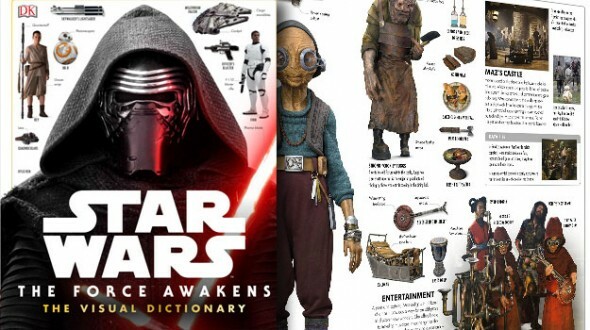 Of further interest in this new film is that in addition to the introduction of Maz Kanata, we are also introduced to another new character earlier in the film played by Max von Sydow (Lor San Tekka), an actor renowned to fans of science fantasy/ horror as Father Lankester Merrin, veteran Catholic priest (rather than Church of the Force priest;) from the classic film, The Exorcist. Recall his character in that film finds the amulet resembling the statue of Pazuzu on an archaeological dig in Iraq, the demon he defeated years earlier (as shown below). It’s interesting that the statue of Maz Kanata in Anakin Skywalker’s bedroom on Tatooine appears to have the one flat tone, just as does the statue of Pazuzu above. 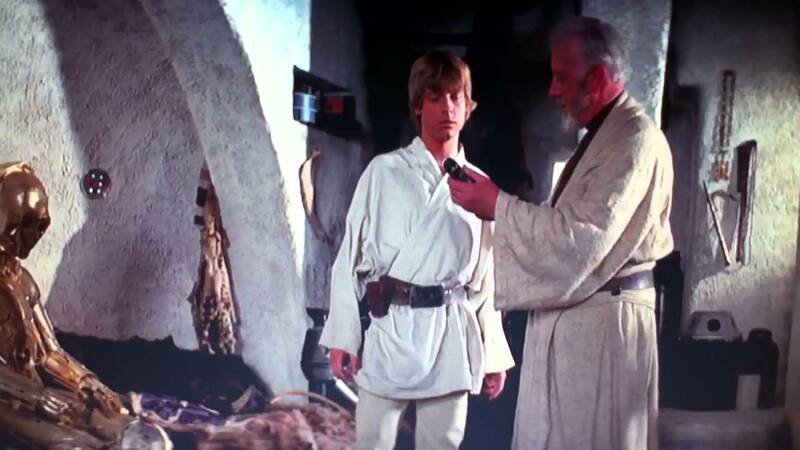 As for who Maz’s agent on Tatooine was, recall that when young Anakin met Qui-Gon Jinn he recognised him as a Jedi almost immediately, suggesting he had previously encountered one (somewhat unusual given the Jedi were not tending to interfere in events in the Outer Rim prior to their realisation of the re-emergence of the Sith). So was that agent perhaps Quinlan Vos, the dreadlocked dude sitting outside the Cantina shown below observing the conflict that broke out between Sebulba, Jar Jar Binks and Anakin (who was later revealed to be a Jedi in The Clone Wars). 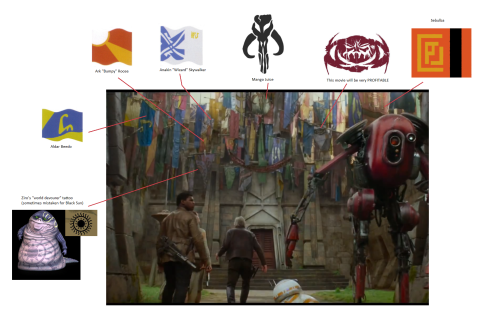 Or, given Kanata’s castle is meant to echo the original “hive of scum and villainy” that was the Mos Eisley Cantina, with its primary patrons being smugglers, might this suggest that Maz doubled as a smuggler herself, or better yet a slave trader in the years leading up to The Phantom Menace?! Was she the one who first sold Shmi Skywalker to Gardulla the Hutt to ensure the Force-sensitive child, Anakin, was raised in an Outer Rim Territory where it would be less likely for him to end up identified by the Jedi Council and trained in the ways of the light side from an early age? Was she perhaps the Sith Master of Darth Plagueis, and compelled him to manipulate the midi-chlorians to create Anakin? She is after all even older than Yoda, having been revealed by J.J. Abrams to have lived “over a thousand years”!!! 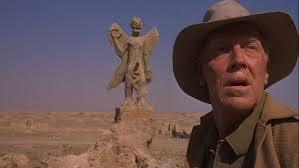 And is Max von Sydow’s inclusion in the film as priest of the Church of the Force meant to make us recall the demon Pazuzu with whom his character was said to have done battle with in The Exorcist? …was built on an ancient Jedi and Sith battleground, but that the working title of the film during production was “The Ancient Fear”. While this “ancient fear” could be interpreted as Supreme Leader Snoke, he hasn’t been referred to as such yet, whereas J.J. Abrams has made an effort to point out that Maz is over one thousand years old. Also, according to the visual dictionary, she is Force sensitive, but not trained in the Jedi arts! This immediately brings to mind Palpatine’s own background as a Force user who was recruited by the Sith Master, Darth Plagueis, before the Jedi had an opportunity to train him. …and which he lost (along with the hand he wielded it with) in battle against his father on Cloud City in the overture to that most famous of scenes in Star Wars Episode V: The Empire Strikes Back. 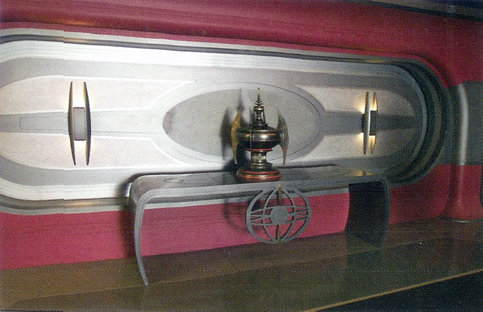 …who remained behind on Coruscant contacted Maz, as per Palpatine’s instructions in his last Will & Testament, for her to come to the Imperial Palace to retrieve it along with his treasure trove of Sith artifacts, including those shown decorating his chambers in Star Wars Episode III: Revenge of the Sith? …the frieze depicting a battle between the Jedi and Sith during the Great Hyperspace War. 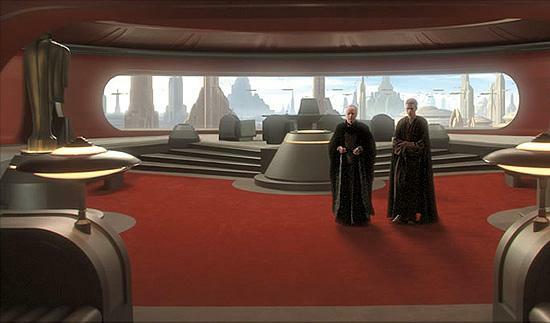 …which the Emperor used as his private sanctum, are rumoured to have once been a battleground between the Jedi and the Sith. So she perhaps had her castle erected over it to ensure she could get first dibs on any Sith relics left behind on the battlefield, which could go a long way to explaining her secret treasure room where Rey retrieved Anakin Skywalker’s lightsaber (previously lost by Luke, along with his hand, when doing battle with Darth Vader on Cloud City) and which also included a mask that looked a lot like those worn by the Knights of Ren (along with robes seen sitting on the floor). 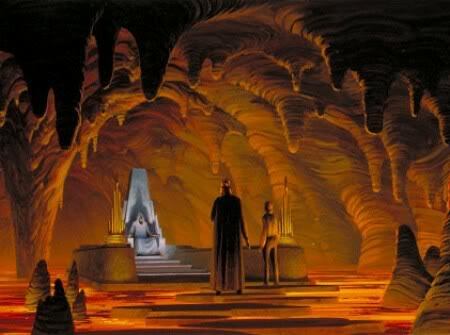 …considered as canon by Disney, it is revealed that the Jedi Temple on Coruscant was constructed over a Sith shrine, and it was the dark side energies emanating from it that were clouding the Jedi’s vision the Prequel Trilogy. So if Maz Kanata’s castle was similarly built on an ancient Sith battleground wouldn’t it similarly cloud any Light Side visions? So wouldn’t that mean if Rey’s vision was so strong that it was influenced by the Dark Side? And when Maz says of the vision to Rey, “The Force, it’s calling to you. Just let it in”, isn’t it more likely it is the Dark Side of the Force that would let itself in? Now why would Maz, who displays an innate understanding of the Force, be suggesting to Rey that she “let it[the Dark Side] in” unless her claim that she is “no Jedi” is meant to subtly suggest that she is a Sith who would of course want an untrained Force-sensitive user to open themselves to it.